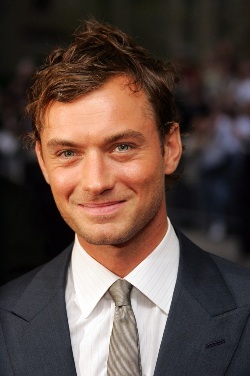 David Jude Heyworth Law (born 29 December 1972 in Lewisham), known professionally as Jude Law, is an English actor, film producer and director. He began acting with the National Youth Music Theatre in 1987, and had his first television role in 1989. After starring in films directed by Andrew Niccol, Clint Eastwood and David Cronenberg, he was nominated for the Academy Award for Best Supporting Actor in 1999 for his performance in Anthony Minghella's The Talented Mr. Ripley. In 2000, he won a Best Supporting Actor BAFTA Award for his work in the film. In 2003, he was nominated for the Academy Award for Best Actor for his performance in another Minghella film, Cold Mountain. He is also known for his role as Dr. John Watson in the Sherlock Holmes (2009) film series. Not to be confused with Jennifer Lawrence who somehow got the nickname "J-Law" contrary to Jude's existence. Fake American: Many of his roles are this. Mr. Fanservice: He tends to appear in many "Sexiest Man Alive" lists, especially during the Turn of the Millennium. Production Posse: Most famously with Anthony Minaghella. Protagonist Title: Many of his leading roles are the eponymous hero of the story. Shakespearian Actors: He began acting with the National Youth Music Theatre and been in many plays, including Hamlet and Henry V, ever since. Star-Making Role: The Talented Mr. Ripley. Those Two Actors: Frequently co-star with Gwyneth Paltrow and Kate Winslet. He dropped out of the movie From Hell. Additionally, he was originally considered for the role of Shinzon of Remus in Star Trek: Nemesis and the role of Will Turner in Pirates of the Caribbean: The Curse of the Black Pearl. Bryan Singer originally wanted him to play Zod in Superman Returns. He was originally cast as Ozymandias in Watchmen, and was attached to the role late enough in pre-production that his likeness is clearly recognizable in the character's costume sketch ◊. His reasons for dropping out remain unknown, and he was replaced by the then-relatively unknown Matthew Goode instead, in keeping with the idea that the story should be a bigger star than the actors involved. For the matter, he had also expressed interest in playing Rorschach.